" Your guide to modern cloth nappies"
Very similar to a pocket nappy (i.e. with a sewn in lining), but with a few extra features thrown in. The white inner microsuede lining features a sleeve design instead of a pocket design. The lining is open on both ends of the nappy which makes it a little easier to stuff the inserts into the nappy - the insert can be stuffed/positioned from either end. The sleeve design also means that the inserts will "self-agitate" in the wash - so it's not necessary to remove the inserts from the sleeve (with a pocket nappy the inserts must be removed before washing - this is a very simple process using only the very tips of your fingers). It has an additional waterproofing strip along the tummy to help prevent liquid creeping up baby’s clothes if the clothes slip inside the nappy along the tummy. The BiddyKins All-In-Two Sleeve Nappy also features a double leg gusset, which is intended to offer extra protection against leaks around the legs – but only if the inserts are slipped into the sleeve. However it is important to note that the single gusset found on standard pocket nappies work just fine and in our view the double gusset is really not a necessity. The tabs feature a squared off design, as opposed to the rounded tabs of a standard pocket. The cut of the nappy is also slightly larger than a standard pocket. There is also a snap on the inside allowing a bamboo insert to be clipped in and held in place if lying on top of the lining. 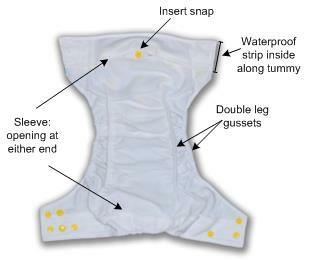 The down side of a sleeve nappy is that all these extra bells and whistles do make the All-In-Two a little bulkier, especially between the legs, when compared to a standard pocket nappy. BiddyKins Sleeve Nappies are similar in size to a standard pocket nappy - i.e. also a “one-size-fits-most” design (±4.5Kg - ±16Kg), and are sold with two bamboo inserts as standard. Keep in mind when comparing a sleeve with a pocket nappy, that a pocket nappy, when used with two bamboo blend inserts, will last exactly the same time on the bum (ie absorb exactly the same volume of wee) as a sleeve nappy. This is because the only components of the nappies that are absorbent are the inserts. So using two bamboo inserts in a pocket nappy will make the pocket nappy last just as long as a sleeve nappy with the same two inserts. Due to the additional work involved in sewing up a sleeve nappy with its extra bells and whistles, it does cost a bit more. The extra bells and whistles do also make the sleeve nappy quite a bit bulkier between the legs than a pocket nappy.